I always smile when people talk about the ‘fuzzy’ front end of innovation, ‘fuzzy’ tells a story. I think we should name the back end of innovation as ‘rugged’ to tell an equally important story. This is the end where the ‘last five yards’ separate the winners from the losers. The race before then has been made up of often huge quantities of stamina, fortitude, planning, exploration and getting into that necessary innovation rhythm to get yourself within sight of the finishing line, the point when the product, service or business model has one final gasp and passes over that internal finishing line. The critical passing-through and launch phase where the finished concept goes through that clear defining moment, out into judgement day, where we enter that hostile environment, the market place, sometimes to loud cheers, sometimes to defining silence. Welcome to the real world of judgement where those experienced enough in frontier-ship know well the terrain they are passing over, certainly not for the first time but for many it is a little daunting. How can we manage the art of execution consistently to have a final successful outcome- better sales delived on a solid innovation offering? Hitching your wagons and moving out for the first time. Discovering any innovation is hard work. What we all want to do is provide something new, an advancement on something that is already there, or it is simply not really innovation. We search hard for making those breakthrough moments when you hit on that undiscovered ‘unmet need’ and the market place just loves it. Innovation execution is not a smooth process, you often have no control over making your innovation activity a steady process, it is full of surprises. It is how you manage these will determine winners from losers. Innovation is serendipitous, full of fortunate discoveries, often you stumble across something that takes it further forward. Often you cannot even replicate that moment. Other times it is simply elusive until by accident and through patience you get there. You resolve the obstacle, you overcome the objection, you move on. Often innovation is often less than spectacular. You get to the moment of rolling drums and voila, whipping back the covers you cry “there you have it!” You offer something less than spectacular, it is so boringly such a ‘duh’ moment, you are ready to crawl back under the rock. Your innovation execution lacks momentum. Even with lots of initial enthusiasm and best intentions, suddenly all that necessary energy dissipates and falls away. What started as a bang ended with a whimper and a desperate need to finish this off and move onto the next thing. What separates successful execution innovators from the rest of the pack? Innovation needs to be a clear discipline; there really is no getting away from it. Innovation needs to be integrated from idea to execution, to full end market delivery. It often boils down to discrete and manageable tasks well managed, well orchestrated and planned, well supported with all the best resources available to make a success of innovations implementation. Execution, that final all-important phase needs leadership. Leadership sets the tone and communication what is important and is always ready and able to help the implementation team succeed as best they can. These leaders need three traits- 1) a bias for action irrespective of the problem, 2) knowledge and contacts in the market place themselves to gauge quickly issues and roadblocks, 3) they incentivize the execution team for providing break through solutions and moving them forward quickly. How many times though does leadership seem to slip away at the moment of execution? They feel the hard ‘yards’ have already been covered, the innovation is ready to go and they commit a series of execution sins. They extract critical resources at the wrong time and work them back into the organization far too early. The research group have moved on, the product manager has been re-assigned, the research didn’t cover that last concept change to check its value in the market, the final packaging design was subjected to last minute economies and runs the risk of compromising the final delivery of the product. This sin list could run on and on, you know these as they constantly happen. The leadership had the pedal pressed to the floor so hard to get the product ready for launch, they just took their foot of this pedal at the crucial moment and the product goes ‘sliding’ out the door and simply crashes into that first formidable barrier, customer rejection and you were not ready for it. So much can be placed at risk due to this lack of ‘execution’ focus. Leadership needs to be as much in their ‘deployment zone’ as the team assigned the job. They set and live the expectations, they define the critical deliverables, establish accountability and resolve the conflicts quickly, they install metrics that are execution specific, they actively seek commitments from the team, share in achieving them from their customers and they share the good and bad parts of the progress back into the organization. They communicate accurately and frequently, keeping on top of issues, breaking down problems, reaching back into the organization for help when help is needed. They offer true leadership, from the front. Execution through this commitment has become mission critical and all need to see this. It becomes, over time, the force for perpetual execution. Inertia is not spoken of-ever! Healthy debate – asking, probing, and showing a constant interest in what is going on, what resolved any issues, simply having that cultural bias of ‘qualified’ risk taking and openness, discussing and learning so you are building up always knowledge and experience. Effective communication – ensuring there are the mechanisms in place to ‘flag’, to help, to reach out and ask for help. Use communication not to hide issues but to seek out from others ways to break down the barriers. Appropriate resources – the need to provide the same energy and resource commitment, skills and experience that went into the discovery and development of innovation and ensuring equal ‘vested’ interest from all is there in achieving the concepts aims at the execution time; at the moment of customer experience. Gather the resources quickly, learn fast if it doesn’t and work to find solutions that can resolve it, so it does. The five phases of execution adventure – just keep those wagons rolling! The ‘innovation execution emotional wave’ makes it hard ground to travel. I was reading recently about Gartner’s hype cycle, one article written by Graham Horton gave me a thought for this piece. The hype cycle was developed to visualise the media coverage of a new technology and it goes through five distinct phases. Actually I really think one version of this applies, with adaptation (and due acknowledgement to them) for the ongoing journey we often face in execution of a product once it has entered the market place- that hostile terrain I spoke about. We go through a real ‘emotional wave’ of innovation execution. 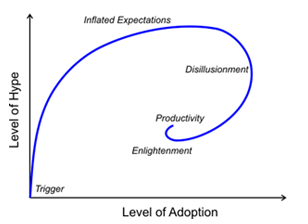 Inflated expectations: the over-enthusiasm and expectations of the innovation meet the reality of the market place. Productivity: The adjustments have been resolved, the peaks and troughs have been worked through, and it becomes appropriate to the customers’ needs. This might have needed second and third generation modification and upgrade but it does the job it was conceived to do. Bringing the innovation execution wagon train home is hard. I do think new products and services do go through this ‘emotional execution wave’. Execution is hard; it is not simply the ‘last five yards’ it goes well beyond the internal finishing line. Innovation does not stop when it goes out of the organizations doors, it actually only just begins, and it has to prove itself. To make innovation work, it is only when it is in the market place, judged by customers sufficiently enough to stump up their cash we have a successful innovation. To get there is often travelling over some rough, tough terrain and the more you are exposed, the more you learn. When you execute you need to deploy a significant skill set and dedicated resource to bring home the results. Fuzzy front ends, huh! Markets have these tasty morsels for breakfast if they, firstly, have not listened to the market needs in the first place but more importantly, have not been executed correctly. The back end, execution, is certainly rugged terrain, that final frontier to travel that is for sure. Don’t miss a post (3,500+) – Subscribe to our RSS feed and join our Innovation Excellence group! Great article/blog. Thoroughly insightful. Thanks for taking the time to share it.